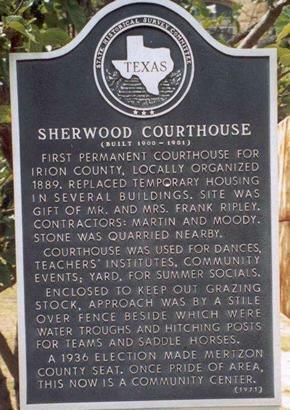 Sherwood, Texas, & first Irion County Courthouse. In a familiar case of death-by-railroad, Mertzon became the county seat in 1936. 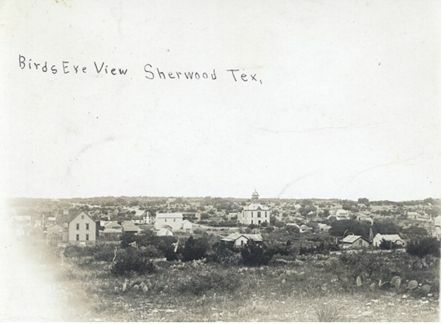 This was merely a technicality since Sherwood had all but been abandoned when the railroad by-passed it by two miles in 1910. 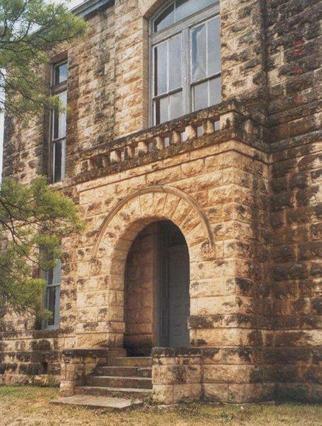 The now privately owned courthouse is available for special events and festivals. The clock faces had painted hands. This was not an uncommon practice in counties across the U.S. in the 19th Century. The present Irion County Courthouse in Mertzon is one of the ugliest in Texas. 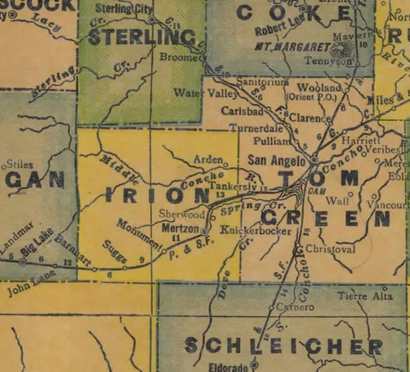 The entire Irion County population is less than 2,000 with about half living in Mertzon. Nearby is the site of the Battle of Dove Creek (see marker), although it is on private land. This fight took place in January of 1865 and involved a Confederate Frontier Battalion and a large number of Kickapoo Indians who were en route to Mexico (where they remain today). The Confederates engaged the Indians who were well defended by terrain. A rare snow was falling and after the battle the defeated Southerners resorted to eating some of their horses. Nothing was accomplished except for creating a hostile border environment for many years later. The Kickapoo Indians today maintain dual Mexican - U.S. Citizenship. 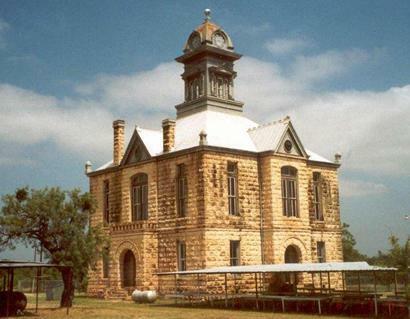 First permanent courthouse for Irion County, locally organized 1889. Replaced temporary housing in several buildings. Site was gift of Mr. and Mrs. Frank Ripley. Contractors: Martin and Moody. Stone was quarried nearby. Courthouse was used for dances, teachers' institutes, community events; yard, for summer socials. Enclosed to keep out grazing stock, approach was by a stile over fence beside which were water troughs and hitching posts for teams and saddle horses. A 1936 election made Mertzon county seat. Once pride of area, this is now a community center. 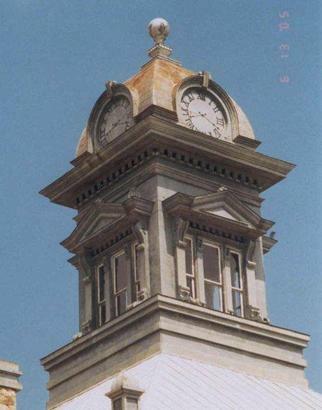 The courthouse's clock tower with the time painted on. 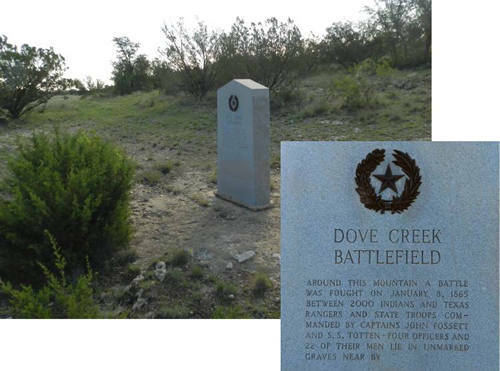 Around this mountain a battle was fought on January 8, 1865 between 2000 Indians and Texas Rangers and State Troops commanded by Captains John Fossett and S. S. Totten. Four officers and 22 of their men lie in unmarked graves nearby.